I don't like Derby Days. There, I have said it. A massive game, the biggest crowd of the season, a raucous, sometimes volatile atmosphere and I don't enjoy it one little bit. 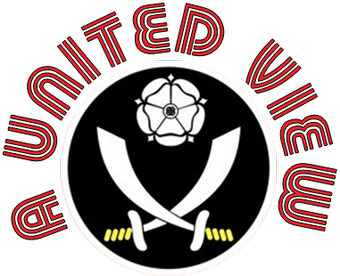 For me Sheffield United v "the team from S6" turns me into an anti-football fan. Derby Day for me is not necessarily all about winning, although clearly that is what I really want. The important thing for me is not losing. As long as "they" don't have the upper hand, the bragging rights, I don't care. The imperative following the match, is to focus on finishing above them in the league table. Don't get me wrong, Sheffield Derby days are special occasions, something perhaps never properly recognised by the national media; although Sky Sports seem to be building the hype this time. Maybe as much to do with the scoreline and ebb and flow of the game at Hillsborough earlier this season as the occasion itself. The intensity of noise and the atmosphere generated within Bramall Lane (or even dare I admit, the other place) could easily be compared with the other derby matches traditionally viewed as the standard bearers; Merseyside, Manchester, Glasgow. In fact the intensity is probably up a notch from Manchester and Merseyside. The build-up leaves you twitchy, distracted, running over scenarios in your head, imagining the joy of victory, fearing the heartache of defeat. You look forward with a mix of trepidation and excitement that leaves you nauseous. You cling to the clips of past successes, reliving the joy and the moment, thinking back to wherever you were watching from at the time. The people you hugged the life out of, the people you fell over, the smell of the beer that went flying through the air and soaked into your top. You hope that recent success and league position count for something, but then the gnawing doubt kicks in and you remember that this is more of a cup game and it is all up for grabs on the night. You admire how a fellow fan and now manager has channelled that adrenaline, that excitement, into something positive with your team. You hope that they respond in the same way again and thrive in a more positive, but no less hostile atmosphere at home. With these special occasions being of such rarefied intensity, just what is my problem? My negative feelings arise for three reasons. My formative football watching years saw "them" generally have the upper hand in terms of league standing. I grew up in an era where United and "the other lot" were in different divisions, derby games were reserved for a pre-season friendly, the County Cup, a testimonial match or a Zenith Data Systems Cup game. Rarely did we win, or so it felt. Most of my friends were not United fans, they knew how to gloat, they knew how to belittle. Even then delusions of grandeur were visible; the first signs of the self-belief that have led to the proclamations of how massive they are today. But bigger, older, better can just as easily be read as bloated, decrepit and under-performing. In those days I didn't want to play "them", I just wanted "them" to fail. I wanted them to swap divisions with us. To fall away into a long decline. The second reason comes from an earlier stages of my life and my first real Sheffield Derby memory. I was 4, but I wasn't at a match. United, ahead in the Division 3 table, lost 4-0 at the other place on Boxing Day 1979. I remember the anguish of my father and grandfather as they arrived home to continue a family Christmas marred by events on the football pitch. All that frustration was kept for posterity on an audio cassette by my mum. The click of play/and record as the front door clicks open and then bangs to. My running footsteps out of the lounge into the hallway; "4-0 Grandad!" I say in surprise and slight indignation. "I know….they were rubbish…." he mutters forlornly. Voices then tail off as both my father and grandfather head into the kitchen to vent their frustrations, out of view and out of earshot of the children. By the time we looked to gain revenge at Bramall Lane in April, we had fallen away from the top end of the table, whilst they were heading for an inevitable promotion. A 1-1 draw was played out, remembered more for Terry Curran's goal for them, rather than anything the Blades achieved. I think I was there, I can't say I remember. As a 5 year old, the games I attended blurred into one a little, even those with 42,000 in the ground. These initial memories of Sheffield Derby games can scar a young child; seeing the effect it had on my Grandad, a man not afraid to let his passions and his hurt show where football was concerned. Defeats like Boxing Day were taken like a personal affront to his support. The subsequent relegation to the Fourth Division was something he never really got over, he passed away a week or so after that game against Walsall. The next time we were to play a league derby was some 11 years later. For one season prior we had swapped divisions, but they had come straight back up to the top division. As a 16 year old I understood more about football then. I was passionate about football then. That first league derby in 11 years was, thanks to police advice, played on a misty November Sunday at Bramall Lane. The other lot were flying on their return to the top flight and expecting a comfortable win. I remember the early tension vividly and then the outpouring of sheer joy of watching young Blades midfielder Dane Whitehouse breaking forward, bearing down on goal and slotting home the first goal. Then in the second half, Brian Deane squeezed the ball between Chris Woods' legs to send Blades fans into ecstasy and leave Woods facing months of mocking for his bow-legged keeping. His situation not helped by United winning the return match across the city 3-1, although he was less culpable that night. Much happier times indeed, although I think I enjoyed post-match celebrations as much as the day itself. In the time since we have enjoyed what feels like a slight upper hand in Steel City encounters. Despite that, I cannot say I have enjoyed the matches per se. Even being 3-0 up at half time, as it was in 2009 at Bramall Lane, you can never sit comfortably and enjoy the rest of the game. On that occasion the Blades were pegged back to 3-2 and clung on. I was the sole football fan in a Greek hotel bar that night, a long standing fortnight of family holiday coinciding with just one home game being played when the fixtures were announced. Yet those who joined me found it hard to sit with a man who was on holiday to relax and have fun, yet appeared to be displaying all the signs of a man on the edge of a nervous breakdown until he exploded in hysteria at the final whistle. That really highlights my final reason; that even when you are in front, the 90 minutes are defined by a feeling that can only be described as someone grasping hold of your guts and twisting them into a tight ball. 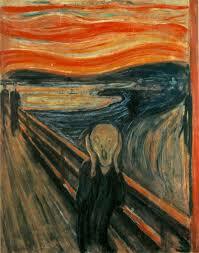 You stand there, in a pose resembling Edvard Munch's The Scream. Your legs shake violently, banging against the people in the adjacent seats. You lean forward, twitching, before launching out of your seat to roar out your support for your team or hurl spittle laden invective at the opposition players and the their fans, amongst whom are many of your friends. By the end, if you have won, something Blades fans have experienced more than Owls over the years, you celebrate. Well you try to. Hoarse from exhortations, legs drained of nervous energy you try to jump up and down and shout, but it doesn't quite happen. No matter what it looks and sounds like, it is the fact you are attempting to do it that matters. I don't really enjoy experiencing such extreme behaviour and emotion. Not because of being a killjoy, not because I have a lack of passion, nor from any attempt to keep up appearances, but from seeing the effect of letting a game consume you and your health as it did my Grandad. Not letting things go, letting results rule your moods and your life. We have been fortunate that for most of the last 20 years we have been above our city rivals; for 12 years we held the upper hand in terms of final league position until that switch 5 years ago. Despite all the incredible highs and gut wrenching lows of these matches, I am much happier to define our success over Wednesday based on the league tables. Give me a season where we are sat in a division above Wednesday, rather than playing them twice a season. But if we have to play them, as long as we don't lose that is all that matters….and then let's set about ensuring we finish above them in the league, wherever that takes us this season.